Create Your Own Disease for Fun and Profit! Brilliant! That is all I can say about Mike Adams, the Health Ranger. Create your own disease for fun and profit. IDMDWC primarily involves unpredictable episodes or experiences characterized by the presence of extreme anger towards authority figures when engaging in strenuous cognitive activity, exacerbated by an uncomfortable and unnatural inability to defecate. Found the disease you like? Take these steps to get filthy rich! Patent a dangerous chemical as a “treatment” for IDMDWC. Invent fictitious trial results that prove the drug is effective in treating IDMDWC. Submit to the American Psychiatric Association for inclusion in their DSM-IV (the standard reference guide of psychiatric disorders). Create an emotional TV ad that shows unhappy, confused people being transformed into perfect beings after they take your drug. Issue press releases to mainstream media outlets who will run your propaganda as news with zero skepticism. Bribe doctors with vacations, extravagant meals and “consulting fees” in order to get them to prescribe your drug to as many patients as possible. Buy off politicians and legislators to block alternative medicine and enforce a pharmaceutical monopoly. Sit back and rake in the dough** while Americans go broke buying your drug to treat IDMDWC! When the lawsuits roll in from the families of dead patients, simply use a small portion of your windfall profits to settle out of court, admitting no guilt. The Disease Mongering Engine is a satirical commentary on various matters we believe to be of public concern and are offered as Free Speech within the protection of the First Amendment to the US Constitution. Filed under: corruption, Eugenics, Government-sponsored terrorism, Terrorism, Vaccines | Tagged: disease, drugs, profit, swine flu |	Comments Off on Create Your Own Disease for Fun and Profit! America’s silent killers are deadly, and do not discriminate. They target babies, the elderly, teenagers, young adults, middle-age housewives, and businessmen alike. They poison livestock, pets, and wildlife, and the people behind them deny complicity in the carnage. Who or what are these silent, deadly killers? They are the beautiful, green, uniform, and seemingly beneficial, killing fields of genetically modified (GMO) crops. The people behind them are the U.S. government, the Rockefellers, Monsanto, Dow, DuPont, and Syngenta. NSSM-200 also specifically declared that the United States was to cover up its population control activities and avoid charges of imperialism by inducing the United Nations and various non-governmental organizations to do its dirty work. In 1970, Henry Kissinger said, “Control oil and you control nations; control food and you control the people.” How do you control food? By consolidating agricultural interests into what was to be termed agribusiness, creating genetically modified organisms out of heritage seeds with funding from the Rockefeller Foundation, patenting the new seeds, and making sure that these new seeds are force-fed to U.S. farmers as well as the rest of the world. By holding the patents on these seeds and requiring farmers to purchase new seeds every year, the control is complete. Also, by controlling how these GMO seeds are created, other more sinister uses come to mind. But first, you must convince the world of your good intentions. This is accomplished through lies, deception, and a bit of media manipulation. By promising farmers that this technology was safe, and would result in increased yields at less cost, they were more than happy to give it a try. The fact that in most cases this claim was false had yet to be proven by the innocent farmers that believed the lie. By the time independent studies started revealing that GMO is harmful, it was too late, and the freight train called agri-business was on its way to fulfilling its purpose – to make as much money as possible by spreading GMO seeds as far as possible, and thus gaining control of the population via food. Plantings of Bt [insect-resistant] corn grew from 8 percent of U.S. corn acreage in 1997 to 26 percent in 1999, then fell to 19 percent in 2000 and 2001, before climbing to 29 percent in 2003 and 49 percent in 2007… Plantings of Bt cotton expanded more rapidly, from 15 percent of U.S. cotton acreage in 1997 to 37 percent in 2001 and 59 percent in 2007. Adoption of all GE [genetically engineered] cotton, taking into account the acreage with either or both HT and Bt traits, reached 87 percent in 2007, versus 91 percent for soybeans. In contrast, adoption of all biotech corn was 73 percent. Not content to restrict the use of GMO to the U.S., a larger, more ambitious plan was in the making. By Presidential Executive Order , the US had defined GMO seeds as harmless and hence not needing to be regulated for health and safety. Take a good look at the chart above, and let’s do the math. Keep in mind that all figures are approximate. 1 hectare = 2.4711 acres. In 2006, there were 102 million hectares of land on planet earth devoted to GMO crops, or 252.05 million acres. 1 square mile = 640 acres. Therefore, by 2006, there were approximately 393,828 square miles of GMO crops. The earth’s total landmass is approximately 92,229,476 square miles. In 2005, Taipei Times reported that 40% of the earth’s land mass was being used for farmland. Not accounting for any increase from 2005 to 2006, the amount of land being used for farmland was, in 2006, 40% of 92,229,476 square miles, or 36,891,790 square miles, and this includes grazing land for livestock production. According to Science Daily, “grazing occupies 26 percent of the Earth’s terrestrial surface.” 26% of earth’s total landmass of 92,229,476 square miles = 23,979,664 square miles. So, subtract that from the total amount of land being used for farmland, and we get 12,912,126 square miles of farmland devoted to raising crops. Of this total amount of farmland that is being used to raise crops, 393,828 square miles are devoted to GMO crop production as of 2006. A 5900% INCREASE IN LAND DEVOTED TO GMO CROPS IN A 10-YEAR PERIOD! If you think that this trend cannot continue, think again. It looks like the agri-giants are right on schedule, with an average yearly increase of approximately 10 million hectares of land. 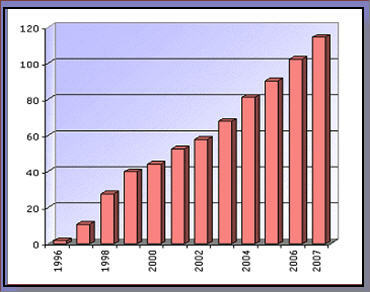 The increase from 2006 to 2007 was 102 to 114 hectares. At this rate, the amount of land dedicated to the growth of GM killing fields will double in another 10 years. 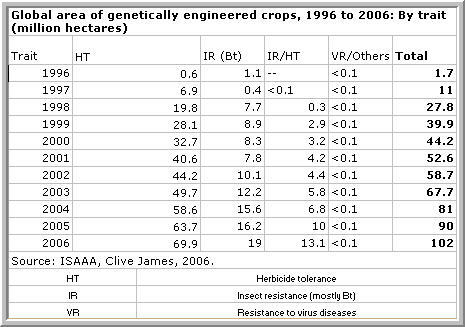 GMO – What Harm Can it Do? Contrary to claims by the U.S. government and Monsanto et al, who claim that GMO crops are beneficial, independent studies have been conducted with shocking results. Evidently, Syngenta’s GMO corn was deadly to a lot more than the corn borer. To make a distinction between the health effects of GMO on animals and humans is reckless at best. If rats that eat GMO soy, and cattle that eat GMO corn have severe health effects and die, then what happens to humans that eat GMO soy and corn, drink milk from GMO-fed cows, and eat beef from GMO-fed cattle? Don’t we deserve more? If GMO killing fields are poisoning the animals whose products we consume, then they are poisoning us also. What does it matter about the issues we fight about if we are being slaughtered slowly and silently by the foods we eat? Not only are we being killed off, but the diseases that we get because of this consumption keep the medical establishment in Ferraris and Penthouses while doctors treat the symptoms of the diseases we contract, while never addressing the cause. GMO killing fields are taking over our farms and stores, as well as our very lives. These silent, deadly killers have been hiding in anonymity since “1992…when George H.W. Bush…issued an Executive Order proclaiming GMO plants such as soybeans or GMO corn to be ‘substantially equivalent’ to ordinary corn or soybeans, and, therefore, not needing any special health safety study or testing” (Engdahl, 2006). Even labeling foods containing GMO ingredients is not allowed. With the proliferation of GMO ingredients, it is no wonder that companies do not want to be responsible for labeling their products. They probably do not know if what they are getting is GMO or not! How can you label something if you do not know what it is? Planting individual gardens with organic seeds, then harvesting these seeds from one year to the next is one way to combat the GMO revolution. Also, local groups devoted to growing organic produce for the communities in which they live can stem the tide of personal GMO consumption one community at a time, at least for a while. The U.S. government, Monsanto, Dow, Dupont, and Syngenta are not in business to keep people healthy. They are in business to make money. Unless this is understood, these corporations will continue using the public as guinea pigs for their experiments in population control, and in so doing, glean ever-increasing profits from the unsuspecting and naive. It is time to stand up and resist these giants by demanding accountability, and using what resources are left to become self-sufficient and say NO WAY to GMO! If we don’t, America’s silent killing fields will do their job, and we will no longer have a choice. Engdahl, F.W. (2007). Seeds of Destruction. Global Research. I am currently reading William Engdahl’s Seeds of Destruction, which documents the takeover of our global food chain by giant transnational agri-business concerns intent on enslaving the population through GMO technology. I am having difficulty reading this book because after a few pages, I become enraged at the colossal greed and corruption that exists in our corporate government, which has no problem murdering whole populations and eco-systems, and reducing the survivors to a life of abject misery and poverty. I find that after reading just a few pages, I have to put the book down, cool off, then pick it up again and read a few more pages before going through the cycle again. Anyway, as I was going through this cycle of reading, fuming, cooling off, then reading again, a thought occurred to me. 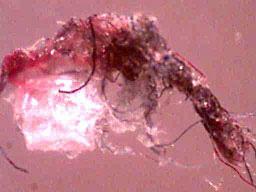 What if the advent of Morgellons Disease has something to do with the ingestion of GMO foods? The timing seems to be rather coincidental, so I did some web research, and here is what I found. [Dr. Drottar] The disabled family practice doctor felt like bugs were crawling under her skin. “If I fully tell people what has gone on with me medically, they think they’re in the twilight zone,” said Drottar. She woke up with the feeling that fluid was flowing just below her skin. 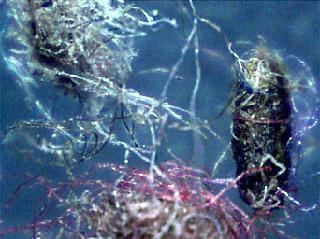 Often black or blue hair like fibers protruded from her skin, she said. “I thought I had been exposed to asbestos. I thought I was having asbestos fibers come out of my skin. I was pulling long, thin, small hair-like fibers that were extremely sharp that could literally pierce through my finger nails,” Drottar said. There is relatively little information regarding research correlating Morgellons with GMO foods. This is suspicious right off the bat, because it would seem that there would be a natural curiosity regarding a link between Genetically Modified Organisms that people ingest regularly and inorganic fibers that protrude from a person’s skin. This would be right up a geneticist’s alley, and quite worthy of intensive research. So, why aren’t there a ton of published studies? 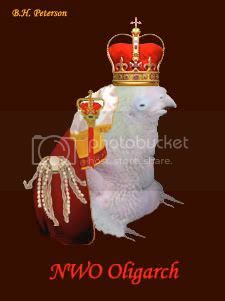 Why did I have a tough time finding anything related to this? Could it be that companies such as Monsanto have enough clout to effectively squash these stories? If they have enough clout to ruin countries by deceiving impoverished farmers into purchasing patented GMO seeds, then end up forcing these poor people to purchase these seeds year after year instead of harvesting their own, then I am sure they have enough clout to ask our more than willing corporate government to manipulate the press…again. 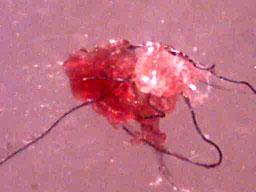 12-Oct-2007 Many people—and most physicians—have written off Morgellons disease as either a hoax or hypochondria. But now there is evidence that this mysterious disease may be REAL and related to GENETICALLY MODIFIED food! I don’t know about you, but I am done with processed foods from the grocery store. We are being hit in our most vulnerable spot – our bellies. Most people my age have been brought up with an innate trust that what they purchase from the stores is safe to eat. This is no longer true since most processed foods contain genetically engineered ingredients. What you purchase from the corner store might just change your DNA and create such frightening symptoms that the general public simply does not believe it. What is worse is that when you go to the doctor to get help, he/she tells you what you are experiencing is all in your head. This is rubbish! It is up to people who care to make the correlations between what we eat and what happens to our bodies. Remember the old saying – “you are what you eat?” Well, I believe it is true. With the stroke of a pen, nations are formed, and with the stroke of a pen, they are destroyed. With the stroke of a pen, ideas are also given birth, and hope reborn. With the stroke of a pen, our nation was formed, and with the stroke of a pen, it was torn apart. With the stroke of a pen, I lift my voice to the heavens to cry out in rage! I rage against the unabated greed of a people gone mad with lust for material possessions, comfort, and wealth. I rage against the death of a world enslaved by greed with the shackles of moral depravity and apathy. All the material wealth in the world will not cover the poverty of soul that lies deep in the hearts of the foolish who count on their hordes of gold to protect them. Material wealth is fleeting. It can disappear in the blink of an eye, and when it goes, what is left – anything? For those whose only goal in life is one acquisition after another, there is nothing left. For those who place their faith in a life beyond what can be seen and felt, there is hope. When all turns to dust, the only survivors will be those clinging to what cannot be seen or felt. Those who barricade themselves behind walls of wealth will not survive; their barricades will turn to dust. Those who cling to the hope that there is something more to life – something other than their possessions – will survive. With the stroke of a pen, wealth is created and lost, but hope is eternal. In a world consumed by greed, hope rises from the ashes like a beacon. I choose to use my stroke of the pen to expose the poverty of material wealth and greed for what it is, and offer a message of hope. It is only a matter of time before the world pukes out this corruption in its belly. This disease is so deep within the bowels of humanity that the world as we know it cannot survive. It is erupting in open sores throughout the world in the form of endless war, torture, perversion, hatred, and fear. These are symptoms of a disease so far gone that the only relief from the agony is death. So, I lift my pen in rage against a dying world consumed by greed – not to destroy hope, but to offer it. Like the birds that live by taking shelter where they find it, we can survive the coming crisis. We can search within to find the strength to carry on after the world as we know it no longer exists. There is more to life than what we see, feel, and hear. There has to be because if there isn’t, then life has no meaning, and if life has no meaning, we are merely dumb brutes clawing our way through time devoid of consciousness. Therefore, I lift the banner of hope reborn out of the ashes of a world destroyed by the disease of greed, and lay claim to life after death – without malice or treachery. Here’s to a new beginning.